US growth – has the windfall of cheap oil arrived or is there a spectre at the feast? The plunge in oil prices since the middle of 2014 has not translated into a dramatic boost for consumer spending, which has continued to grow moderately. This has been particularly surprising since the sharp drop should free up income for households to use toward other purchases. Lessons from an empirical model of learning suggest that the weak response may reflect that consumers initially viewed cheaper oil as a temporary condition. If oil prices remain low, consumer perceptions could change, which would boost spending. Given the perceived wisdom of the majority of central banks – that deflation is evil and must be punished – the lack of consumer spending is a perfect example of the validity of the Fed’s inflation targeting policy; except that, as this article suggests, deflations effect on spending is transitory. I could go on to discuss the danger of inflation targeting, arguing that the policy is at odds with millennia of data showing that technology is deflationary, enabling the consumer to pay less and get more. But I’ll save this for another day. The steep decline in oil prices since June 2014 did not translate into a strong boost to consumer spending. While other factors like weak foreign growth and strong dollar appreciation have contributed to this weaker-than-expected response, part of the muted boost from cheaper oil appears to stem from the fact that consumers expected this decline to be temporary. Because of this, households saved rather than spent the gains from lower prices at the pump. However, continued low oil prices could change consumer perceptions, leading them to increase spending as they learn about this greater degree of persistence. In a related article the Kansas City Fed – Macro Bulletin – The Drag of Energy and Manufacturing on Productivity Growth observes that the changing industry mix away from energy and manufacturing, towards the production of services, has subtracted 0.75% from productivity growth. They attribute this to the strength of the US$ and a decline in manufacturing and mining. …even if the industry mix stabilizes, the relative rise in services and relative declines in manufacturing and mining are likely to have a persistent negative effect on productivity growth going forward. The service and finance sector of the economy has a lower economic multiplier than the manufacturing sector, a trend which has been accelerating since 1980. A by-product of the growth in the financial sector has been a massive increase in debt relative to GDP. By some estimates it now requires $3.30 of debt to create $1 of GDP growth. A reduction of $35trln would be needed to get debt to GDP back to 150% – a level considered to be structurally sustainable. With energy input costs falling, the beneficiaries should be non-energy corporates or consumers. 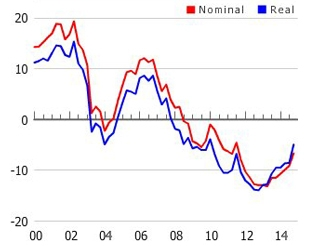 Yet wholesale inventories are rising, total business sales seem to have lost momentum and, whilst TMS-2 Money Supply growth remains solid at 8%, it is principally due to commercial and industrial lending. US oil production has fallen below 9mln bpd versus a peak of 9.6mln. Rig count last week was 351 down three from the previous week but down 383 from the same time last year. 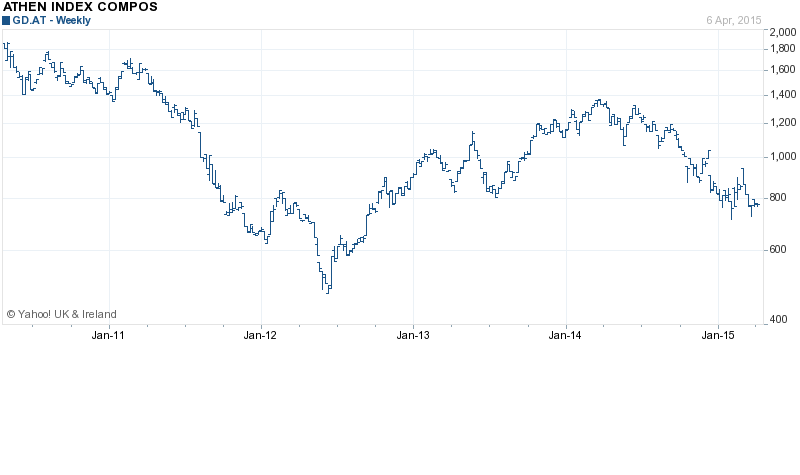 Meanwhile the failure of Saudi Arabia to curtail production, limits the potential for the oil market to rally. A combination of much less household debt, revived access to consumer credit and recovering asset prices have bolstered U.S. consumer spending. This trend will likely continue despite an estimated 50 percent reduction since the mid-2000s of the housing wealth effect— an important amplifier during the boom years. …Since the Great Recession, the ratio of household debt-to-income has fallen back to about 107 percent, a more sustainable—albeit relatively high—level. …The wealth-to-income ratio rose from about 530 percent in fourth quarter 2003 to 650 percent in mid-2007 as equity and house prices surged. Not surprisingly, consumer spending also jumped. The conventional estimate of the wealth effect—the impact of higher household wealth on aggregate consumption—is 3 percent, or $3 in additional spending every year for each $100 increase in wealth. …Recent research suggests that the spendability, or wealth effect, of liquid financial assets—almost $9 for every $100—is far greater than the effect for illiquid financial assets, which explains why falling equity prices do not generate larger cutbacks in aggregate consumer spending. Other things equal, higher mortgage and consumer debt significantly depress consumer spending. …The estimated housing wealth effect varies over time and captures the ability of consumers to tap into their housing wealth. It rose steadily from about 1.3 percent in the early 1990s to a peak of about 3.5 percent in the mid- 2000s. It has since halved, to about the same level as that of the mid-1990s. During the subprime and housing booms, rising house prices and housing wealth effects propagated and amplified expansion of consumption and GDP. During the bust, this mechanism went into reverse. High levels of mortgage debt, falling house prices and a reduced ability to tap housing equity generated greater savings and reduced consumer spending. Fortunately, house prices have recovered, deleveraging has slowed or stopped, and consumer spending is strong, even though the housing wealth effect is only half as large as it was in the mid-2000s. In 2015, we accumulated almost $71 billion in new credit card debt. And for the first time since the Great Recession, we broke the $900 billion level in total credit card debt so we are back on track in getting to $1 trillion. After a long stretch of declines, the labor force participation rate has risen in recent months, driven in part by an increase in the share of prime-age people flowing into employment from outside the labor force. So far, this flow has remained largely confined to those with higher educational attainment, suggesting further increases in labor force participation rate could be relatively limited. …Overall, the scenarios show that while more prime-age people could enter the labor force in the coming years, the cyclical improvement in the overall participation rate may be limited to the extent only those with higher educational attainment flow into employment. In addition, the potential increase in the participation rate could be constrained by other factors such as an increase in the share of prime-age population that reports they are either retired or disabled and a limited pool of people saying they want a job, even if they have not looked recently. Thus, while higher NE flow indicates the prime-age participation rate could increase further, it will likely remain lower than its pre-recession rate. At the 2015 EIA conference Adrian Cooper of Oxford Economics gave a presentation – The Macroeconomic Impact of Lower Oil Prices – in which he estimated that a $30pb decline in the oil price would add 0.9% to US GDP between 2015 and 2017. If this estimate is correct, lower oil is responsible for more than a quarter of the current US GDP growth. It has softened the decline from 2.9% to 2% seen over the last year. I would argue that the windfall of lower oil prices has already arrived, it has shown up in the deterioration of the trade balance, the increase in wages versus consumer prices and the nascent rebound in the participation rate. That the impact has not been more dramatic is due to the headwinds on excessive debt and the strength of the US$ TWI – it rose from 103 in September 2014 to a high of 125 in January 2016. After the G20 meeting Shanghai it has retreated to 120. With 37% allocated to Energy and Materials by 2013 it is likely that the fall in oil prices will act as a drag on a large part of the stock market. Energy and Materials may represent less than 10% of the total but they impact substantially in the financial sector (15.75%). 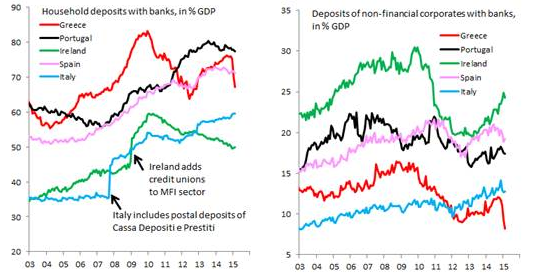 Notwithstanding the fact that corporate defaults are at the highest level for seven years, financial institutions and their central bank masters will prefer to reschedule. This will act as a drag on new lending and on the profitability of the banking sector. The table below from McGraw Hill shows the year to date performance of the S&P Spider and the sectoral ETFs. This year Financials are taking the strain whilst Energy has been the top performer – over one year, however, Energy is still the nemesis of the index. The windfall of cheap oil has arrived, but cheap oil has been eclipsed by the beguiling spectre of cheap debt. 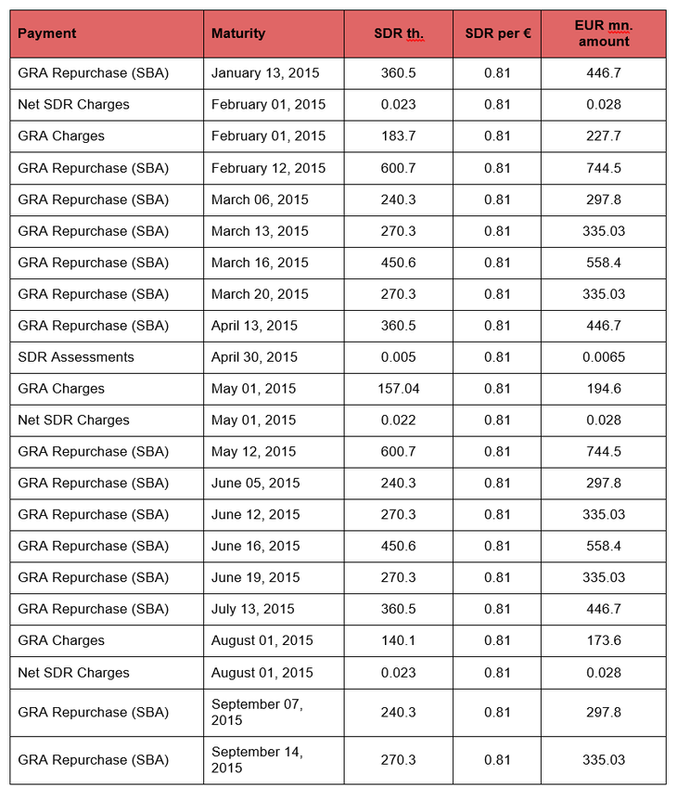 Greece in or out – Investment Opportunities? Earlier this week I paid a visit to the Greek Island of Corfu. Whilst most of what we read and observe about the Greek economy revolves around Athens, I thought it would be useful to gain a broader perspective on the state of the economy. I wanted to consider, what things might be like, if Greece stays within the Eurozone (EZ) or, conversely, if they decide to leave. According to information collated from the CIA Factbook , OECD and Eurostat, the Greek public sector still accounts for 40% of GDP. The largest industry is Tourism (18%) followed by Shipping – the Hellenic Merchant Marine is the largest in the world employing 160,000 (4% of the workforce). The Greek shipping fleet is the fourth largest in the world, representing 15.17% of global deadweight tonnage in 2013, although “flag of convenience” issues can make these figures a little misleading. The labour force is estimated at 3.91mln of which immigrants account for 782,000 (20%). 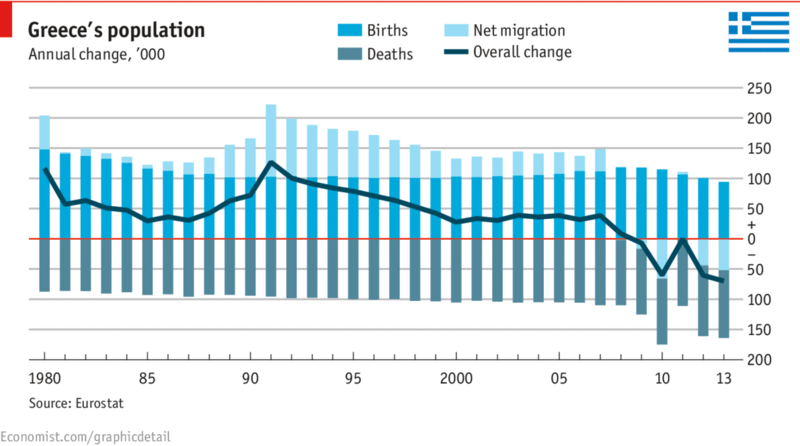 This makes Greece the 8th largest immigrant population in Europe – mainly unskilled or agricultural workers. As a result of the economic crisis private saving has increased from 11.2% in 2012 to 14.5% in 2014. The largest broad industry sector is Services (which includes Tourism) accounting for 80.6% of GDP and 72.4% of employment, followed by Industry – 15.9% of GDP and 14.7% of employment. Agriculture is third in size producing 3.5% of GDP but employing 12.9% of the population. Greece’s largest export market is Turkey (11.6%) and its largest import partner is Russia (14.1%). Little wonder they wish to maintain good relations with Moscow. In terms of Tourism, Greece is the 7th most visited country in Europe and the 16th most visited globally. The latest figure I could unearth, from a 2008 OECD report, indicated 840,000 workers employed in the sector, from which I estimate that Tourism accounts for more than 20% of employment. 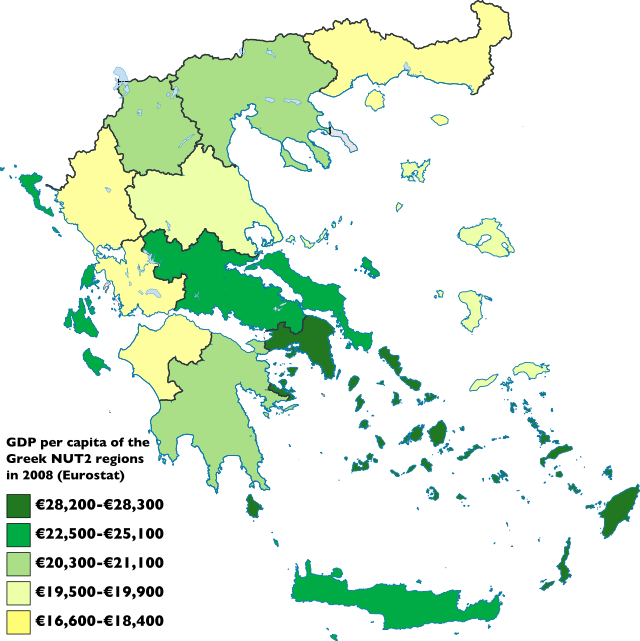 A more detailed analysis of the island economies of Greece came from a paper published by Sheffield University – A Comparative Analysis of the Economic Performance of Greek and British Small Islands – 2006. They analysed 63 islands with an average population of around 300,000. Employment was at 88.81% whilst Unemployed was a mere 11.19% – this was around the average for the whole country at that time. To my surprise, the level of reported self-employment was a relatively low 20.43%. 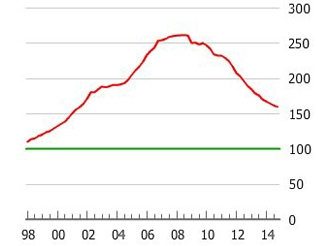 One of the more puzzling figures was for Home Occupancy 46.05%; the Greek average for Home Ownership is 75.8% (2013). Unsurprisingly the main industry is Tourism followed by agriculture – it’s worth pointing out that Greece is the EU’s largest producer of Cotton, second largest producer of Rice and Olives, third largest producer of Tomatoes and fourth largest producer of Tobacco. It also accounts for 19% of all fish hauled from the Mediterranean, making it the third largest in the EU as of 2007 data. I visited Corfu, the second largest island in the Ionian Sea, with a population of just over 100,000. Its main business is Tourism followed by the production of olives. Back in 2013 NCH Capital – a US investment firm, best known for their investments in agriculture in the Ukraine and Russia, agreed a deal with the Hellenic Republic Development Fund (HRDF) to build a tourist resort on the island. This was the first time the Greek state had sold land to a foreign investor for 15 years. The HRDF has been charged with raising Euro 11bln from asset sales by 2016 – this represents a small fraction of the assets available should the Hellenic Republic decide to cut and run. The NCH investment is not moving forward as swiftly as they had hoped, as this article from Tax Law explains. It is worth pointing out that Corfu is located at the North West corner of Greece, its North East coast looking across the narrow straits to Albania; little wonder there is some concern about the reduction of a naval presence in the region. However, Albania became a full member of NATO in 2009. Since 2010 Albanians have been able to enter the EU without visas and, as of June 2014, they are officially a candidate to join the EU. As a result of these changes, property development is growing along with tourism. Prices for Albanian property are significantly lower than in neighbouring Montenegro, which in turn offer better value than Greece. Regardless of the fortunes of Albania, the prospects for a significant acceleration of Greek state asset disposals is likely, whether Greece leaves or remains within the EZ. The residential Real Estate market is still depressed by the economic and political uncertainties of the last few years, but, from a rental perspective, tourists keep returning. The price of dining in restaurants is beginning to look attractive in comparison with other Southern European destinations; perhaps more importantly, the differential with prices in Turkey has narrowed. The cost of more expensive holiday homes in Greece is now comparable with those in Spain or Portugal – it used to command around a 40% premium due to planning restrictions. In 2013 the island of Skorpios sold to a Russian buyer for Eur100mln and the island of Oxia was purchased by a member of the Qatari Royal family for Eur 4.9mln, however, worries about a “Lehman moment” – by which I mean Grexit – have dampened enthusiasm for a number of subsequent deals. If Greece leaves the EZ and the new currency promptly depreciates, there will still be a number of uncertainties. To begin with, the Greek government is likely to impose capital controls to prevent capital flight – Greek Prime Minister Alexis Tsipras has started the process, instructing local governments to move their funds to the central bank earlier this week. For non-domicile property owners, these controls could mean they are unable to repatriate the proceeds of sales. I was interested to notice how many restaurants no longer accept credit card payment; would you put the proceeds of a property sale into a Greek bank whilst waiting for capital controls to be relaxed? Another factor which may delay a recovery in Real Estate is the reaction of non-EU nationals who have bought Greek property for more than Eur250,000, in order to gain EU status – a scheme also available in Portugal. This Greek Law Digest article explains. Selling pressure on property prices will continue to come from Greek domestic investors downsizing of their rental portfolios. During the first few years of EZ membership, many Greeks bought multiple holiday rentals. Since the crisis, maintenance costs have soared as a result of the “haratsi” property tax. Meanwhile, the financial police are aggressively pursuing owners who fail to declare rental income. 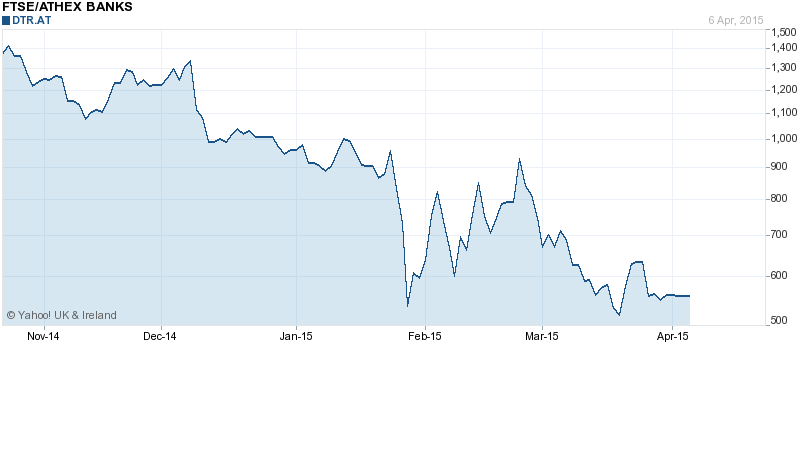 If Greece exits the EU, I would expect Real Estate supply to hang over the market for some while. This article from The Guardian – Home ownership in Greece ‘a sick joke’ as property market collapses from February 2014, attempts to impart a flavour of the overall market, but, as any home owner knows, all property investment is local. To understand the Greek situation you need to go back to the eve of the introduction of the Euro, in 2000, but for a brief overview of the current crisis this excellent video from the Peterson Institute – Greece: An Economic Tragedy in Six Charts is well worth taking five minutes to peruse. Instead, I want to look at the last few months and consider the implications going forward. As the Greek government begin further negotiations with EZ Finance Ministers today, in an attempt to reschedule their outstanding debt and interest rate payments, it is becoming clearer, to politicians in Brussels, that the “Greek Problem” will not be resolved by wishful thinking and continued austerity. Since January a new scene in this Greek tragedy has begun to unfold. Are high wages the main problem in Greece hampering exports? Is the absence of a real depreciation the main driver of the different adjustment experience of Greece compared to the other euro area countries? …hourly wages have come down substantially in Greece and are in fact the lowest in the euro area with the exception of Latvia and Lithuania. This contrasts with the experience in the other three countries adjusting, where hourly wages in the private sector have increased. This does not mean that the current debt trajectory and debt level is sustainable. It may be necessary to further alleviate the debt burden on Greece, especially if inflation remains low and growth is weaker than the Troika believes. This has been done a number of times before by the official creditors and already now the average maturity on the European debt is 30 years. This maturity could be increased if necessary, effectively reducing the debt burden further and I could even see a nominal debt cut at some stage. One can criticize the ECB’s decision for aggravating the crisis but one can also argue that the ECB had no choice but to act as it did given the self-proclaimed insolvency of the Greek state. Attempting to sound an emollient note, Mr Varoufakis told the Financial Times the government would no longer call for a headline write-off of Greece’s €315bn foreign debt. Rather it would request a “menu of debt swaps” to ease the burden, including two types of new bonds. The first type, indexed to nominal economic growth, would replace European rescue loans, and the second, which he termed “perpetual bonds”, would replace European Central Bank-owned Greek bonds. He said his proposal for a debt swap would be a form of “smart debt engineering” that would avoid the need to use a term such as a debt “haircut”, politically unacceptable in Germany and other creditor countries because it sounds to taxpayers like an outright loss. I expect that fear of Grexit will prompt an agreement between Greece and euro-area partners. But my concern is that the agreement will be only a short-term fix and the various constraints will prevent reaching a lasting solution, thereby just postponing the problems. That would be the next stage in the Greek tragedy, as debt sustainability problems would likely return in a few years. Early March saw the publication of the Greek State Budget Execution Monthly Bulletin – the primary balance was only slightly below forecast, but closer inspection revealed that the majority of the improvement in the primary balance has been achieved by reducing expenditures. Revenues were Eur 7.8bln – around Eur 1bln below target. Without the benefit of currency devaluation, the broader Greek economy is still struggling to adjust. The Greek government debt burden is unsustainable, in 2013 its Debt to GDP ratio was 174.9. According to Nationaldebtclocks.org the current figure is Eur 354bln. Greek 2014 GDP was $246bln (Eur189) and GDP for 2015 is estimated to be +0.7% (Eur 190bln) I assume a EURUSD 1.30 exchange rate so, perhaps, I’m painting an overly bleak picture. Official estimates put Greek government indebtedness at nearer to Eur 228bln. 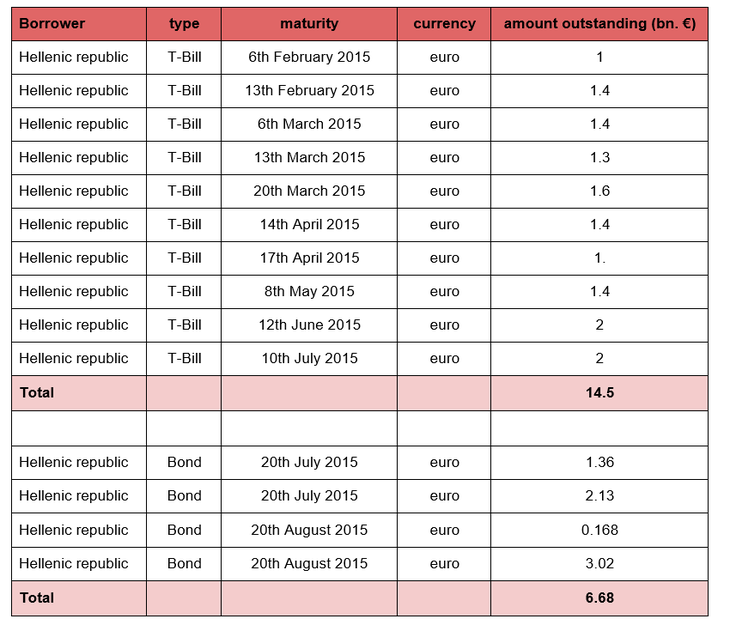 Assume Greece manages to run a primary surplus of 3% in perpetuity – that equates to around Eur 5bln per annum. Assume they manage to negotiate zero interest on all their outstanding debt. 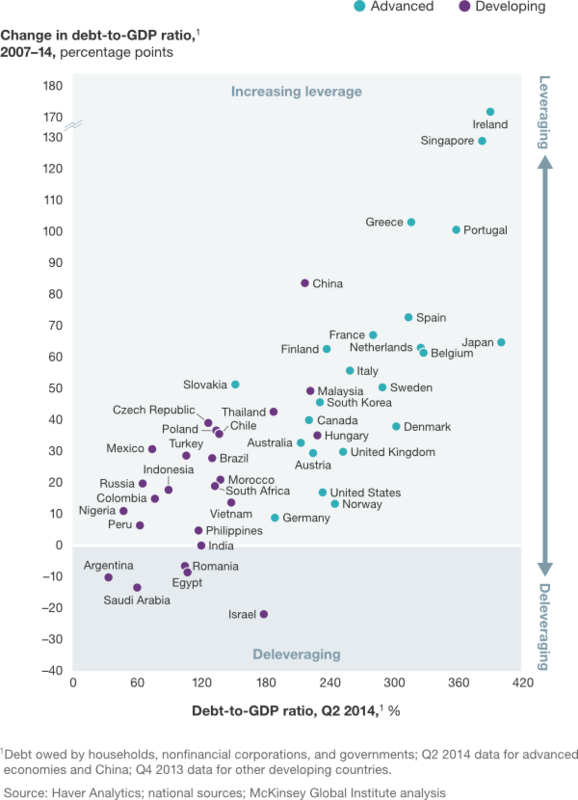 It would take 70 years to repay – and 35 years to bring it back below 100% of current GDP. You may argue that 1. National Debt is the wrong measure, since Government Debt is the issue, but, if Greece leaves the EZ, creditors will need to consider all her obligations. 2. That it is unrealistic to assume no growth in GDP, but Greek GDP growth averaged 0.97% from 1996 to 2014, reaching an all-time high of 7.50% in the fourth quarter of 2003. It crashed to -9.9% in Q1 2011. Meanwhile Greek Inflation averaged 8.94% between 1960 and 2015. Recently deflation has set in, with prices falling to a record low of -2.90% in November of 2013. Banking sector – Our analysis suggests that the Eurozone banking sector should be able to manage the impact of a Greek exit without severe consequences. The exposure of banks in the four largest Eurozone economies (Germany, France, Italy and Spain) to Greece has fallen from around $104bn in 2010 to $34bn. While the German banking system is the most exposed to Greece, this exposure equates to only around 0.8% of its GDP. For the other economies, France, Italy and Spain, the direct exposure of their banks to Greece is less than 0.1% of GDP. Greek debt holders – around 60% of Greek government debt is held indirectly by Eurozone governments. If the Greek government defaults on its obligations, then that debt will be written off (at least in part). This could pose a risk to countries which already have a relatively large public debt burden. For example, a Greek exit could have negative implications for Italy, which guarantees around 20% of the Eurozone’s bailout funds, and has a ratio of gross government debt to GDP of around130%. Italy’s exposure to Greek government debt is equivalent to around 2% of its GDP meaning a default could lead to a fiscal squeeze in Italy as the government attempts to fill the hole left in its finances. Unexpected contagion – A Greek exit could also have effects outside the realm of economic data and financial statistics. It would likely add to political uncertainty as other countries may push for concessions on their commitments or it could set a precedent that sees other countries leave the Eurozone. For example, Spain and Portugal are both experiencing double digit unemployment rates and must hold general elections by the end of 2015. While the domestic consequences of Greece leaving the Eurozone could deter voters in other countries from seeking to leave the single currency area, there remains a possibility of surprising developments occurring in the Eurozone. In addition to this, a Greek exit could also call Greece’s role in the European Union and NATO in to question, spurring even more uncertainty. Of course, the largest creditors are EZ institutions, led by the ECB which holds Eur 104bln – 65% of Greek GDP, according to Governor Draghi. When Must a Deal Be Struck? At the very latest, June/July 2015 would seem to be the deadline. At that point, Greece faces about €6.5 billion in euro bond repayments to the ECB, which it will not have the cash to honor without a new arrangement. A default against the ECB would end all liquidity provisions to Greek banks, including emergency liquidity assistance (ELA) from the Greek central bank. A quick economic death spiral would ensue. For more than three months, Greece’s largest banks have been forced to borrow short-term, higher-interest money from their central bank — a process called emergency liquidity assistance — because the E.C.B. deemed it too risky to extend credit to the banks itself. The banks, in turn, have to provide adequate collateral to obtain these loans, which now stand at 74 billion euros, $79.7 billion, or more than half the amount of Greek domestic deposits. …On April 8, for example, the National Bank of Greece self-issued €4.1 billion of six-month bonds that carried state backing. The true evil started with the bailouts themselves and the resulting usurpation by the EU politicians and apparatchiks of both financial market price discovery and discipline and sovereign democratic prerogatives. Accordingly, the terms of Greece’s current servitude can’t be tweaked, “restructured” or “swapped” within the Brussels bailout framework. Accordingly, Greece’s legitimate debt is perhaps $175 billion based on the pre-crisis euro debt outstanding at today’s exchange rate and the haircut that would have occurred in bankruptcy. Greece’s new government has every right to repudiate the vast amount beyond that because it arose not from the actions of the Greek people, but from the treachery of EU politicians and the Troika apparatchiks—-along with the unfaithful stooges in the Greek parliament and ministries which executed their fraudulent conveyance. There are two other mechanisms through which devaluation could occur, but both are more painful and less efficient than the currency (so called external) devaluation. One way is to simply reduce wages, thus achieving lower prices of domestically-produced goods and making them cheaper abroad. This is easier said than done. Wages are notoriously sticky, and even the wage cuts that Greece accepted have already brought protesters to the streets. Greece reduced wages of public-sector workers in 2010 and again in 2012 and endured months-long strikes. The new Syriza government has just started to undo these measures, with pledges to increase wages to precrisis levels. The other mechanism to achieve internal devaluation is through tax policy—by reducing taxes on labor and increasing consumption taxes. Reducing taxes serves to reduce the overall cost of labor and hence production. It also encourages firms to look for other markets, as higher consumption prices at home reduce demand. Several European countries tried this, including Italy under Prime Minister Mario Monti in 2012—with some success. It’s amazing that household deposits remain so high, but, with the majority of the Greek people wishing to remain in the Euro, perhaps this is logical. TARGET2 claims represent around 70% of the total – this is the loans of peripheral EZ national central banks. 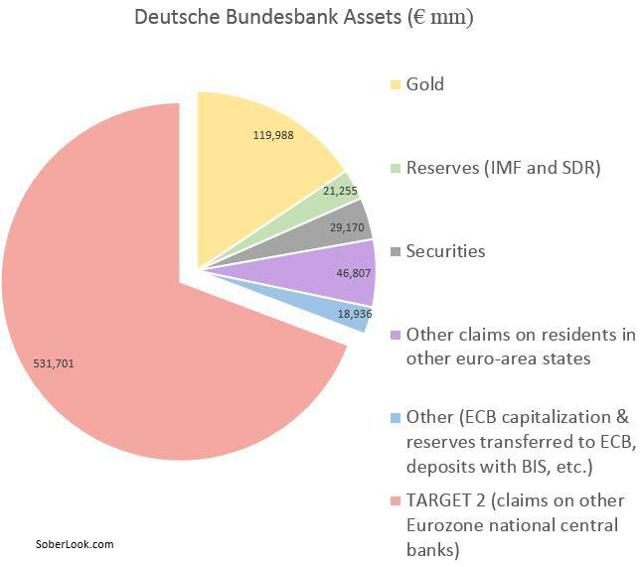 If “Grexit” leads to “Contagion” this half-trillion Euro accounting entry will start to crystallise – the hole in the Bundesbank balance sheet will have to be footed by the German tax payer. And this is clearly not just about Greece. Everyone understands that Greece has already restructured its debt once before and received partial forgiveness — in fact once coupon reductions are correctly accounted for Greece’s debt ratio is probably much lower than the roughly 180% of GDP the official numbers suggest. Most people also understand that the Greek debate is not just about Greece but also about whether or not several other countries — Spain, Portugal and Italy among them, and perhaps even France — will also have to restructure their debts with partial debt forgiveness. “When people talk about the fragility of the euro and the increasing fragility of the euro, and perhaps the crisis of the euro, very often non-euro area member states or leaders, underestimate the amount of political capital that is being invested in the euro. And so we view this, and I do not think we are unbiased observers, we think the euro is irreversible. And it’s not an empty word now, because I preceded saying exactly what actions have been made, are being made to make it irreversible. For now I would argue that the biggest constraint to the EU’s survival is debt. Economists are notoriously inept at understanding how balance sheets function in a dynamic system, and it is precisely for this reason that we haven’t put the resolution of the European debt crisis at the center of the debate. But Europe will not grow, the reforms will not “work”, and unemployment will not drop until the costs of the excessive debt burdens are addressed. In the second scenario, bond yields will trade in a range between high single digits and mid-teens, trading in a broadly similar way to scenario one, though, with less deflation risk, the yields are likely to be structurally higher. The stock market will clear and investment will return. House prices will recover as foreign buyers return and ex-patriot workers come home. Scenario three is the most cathartic. Bond yields will rise dramatically since there will no longer be a strong central bank and few businesses or institutions will be organised to exchange the replacement currency. The new currency will devalue and remain volatile, deterring investors from rushing to invest – once the currency stabilises, bond and equity markets will follow suit. High yield investors will be ready to invest in bonds, equity investors will look for businesses with comparative advantages due to their proximity to, and established trading links with, the EZ. Property will also gradually recover, especially in tourist destinations where “holiday homes” will suddenly become even more affordable for many EZ investors. As I mentioned already, I think scenario two is most likely (45%) though we may have to wait until the “eleventh hour” to see it come to pass. Sadly scenario one is also quite likely (35%) since the EZ political apparatus seems incapable of addressing tough decisions head-on. This still leaves a 20% chance of a “Lehman moment”. As the paper from Sheffield University explains, island economies are relatively insulated from the external ebb and flow of the wider economy. Proximity to Athens is clearly a factor, but the performance of Crete is a typical example of the localised nature of these economic units. Corfu is only 30 miles from the heel of Italy and its Venetian architecture is testament to these links. The islands are most reliant on Tourism and, despite the crisis and the rioting in Athens, tourists keep coming back to these beautiful, welcoming islands. Not unlike Greece’s second industry – Shipping – Tourism is an international business; it is not held hostage to the fortunes of the hapless Greek political elite.